FOR thousands of years, silk has been considered the ultimate fabric for luxury clothing. But the coveted cloth material might soon make its way into the most unlikely of places: the pharmaceutical industry. Scientists from Tufts University in the US have found that silk protein can act as a potent preserving agent for vaccines and drugs. Vaccines are preserved either by using preservatives like thiomersal or through cold chains. While thiomersal is mercury based and can be harmful, cold chains are expensive and cumbersome. Failure to maintain optimal temperature between 2°C and 8°C results in denaturation of drugs. The method is particularly unreliable for developing countries like India that have poor power infrastructure. Over the past few years, many deaths have been reported in the country due to administration of compromised vaccines that were not kept at optimal temperatures. In fact, WHO states that 25 per cent of all vaccines reach their destination in a degraded state across the globe. The team of scientists led by David Kaplan has found that silk protein, fibroin, can keep vaccines and antibiotics intact at temperatures of up to 60°C for over six months. The protein molecule is like a sheet with numerous tiny pockets. These pockets trap the drug molecules and act like a nanoscale bubble wrap to protect them. “This unique structure makes it strong, moisture-resistant, stable at extreme temperatures and biocompatible. These properties make the protein useful for stabilising antibiotics, vaccines and other drugs,” says Kaplan. 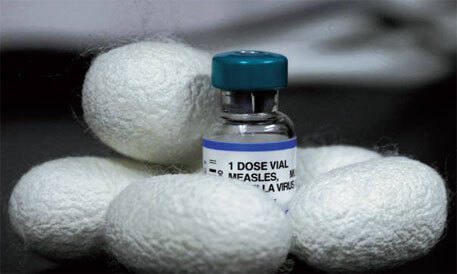 The scientists preserved measles, mumps and rubella vaccine (MMR) and antibiotics like penicillin and tetracycline in silk protein. These were then compared with the manufacturer-supplied vaccine formulation at 4°C, 25°C, 37°C and 45°C. They found that vaccines and antibiotics preserved in silk protein had better stability compared to the standard ones at high temperatures. Scientists say the protein can be successfully used to prepare products like films and micro-needles to store and administer vaccines and antibiotics. The study was published in the online edition of PNAS on July 9. India, with its ample silk supplies, can capitalise on this discovery. “Technologies like these can protect drugs from external shocks such as heat and light. They can revolutionise drug storage by minimising the need for cold storage, bringing down costs and improving coverage of national vaccination programmes,” says Kaushik Chatterjee, associate professor of materials engineering at the Indian Institute of Science, Bengaluru. Silk in Pharmaceutical industry is surely going to revolutionise the world of medicine. A well researched and informative article.